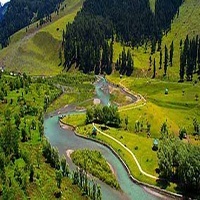 "Pahalgam is a town and a notified area committee in Anantnag district of the Indian state of Jammu & Kashmir. It is a popular tourist destination and hill station. It is located 45 kilometres (28 mi) from Anantnag on the banks of Lidder River at an altitude of 7,200 feet (2,200 m). " Pahalgam is the headquarters of one of the five tehsils of Anantnag district. Pahalgam is associated with the annual Amarnath Yatra. Chandanwari, located 16 kilometres (9.9 mi) from Pahalgam is the starting point of the yatra that takes place every year in the months of Julyâ��August.Pahalgam is located at 34.01Â°N 75.19Â°E. Pahalgam holds a central position in the Lidder Valley. It has an average elevation of 2,740 metres (8,990 ft).Pahalgam has Sub-Tropical Highland climate with long and cold winter with short and mild summer.